Collectors and Stackers affectionately refer to it as the "chunky," and this style of bar used to be minted in limited runs by the now defunct Academy Corporation. 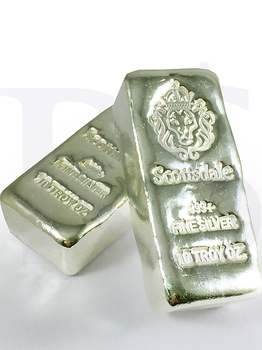 This loaf pour style of silver bar has been out of production for nearly 5 years and Scottsdale Mint is pleased to re-introduce the silver bar that embodies what many stackers agree is bullion perfection. No two bars are exactly alike and the rugged stamped logo has an honest, mature appearance. Yes, there are dips, ripples and burn marks; all not so subtle nods to the old school. Now you can own a bar of a mint style before modern technology. 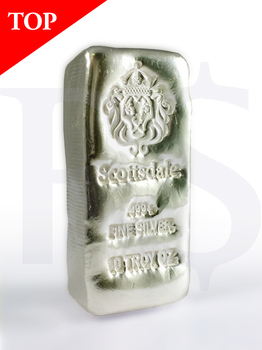 SOLID .999 Fine Silver Bullion. Ten Troy ounces each. ISO Certified and Qualified for IRA storage.